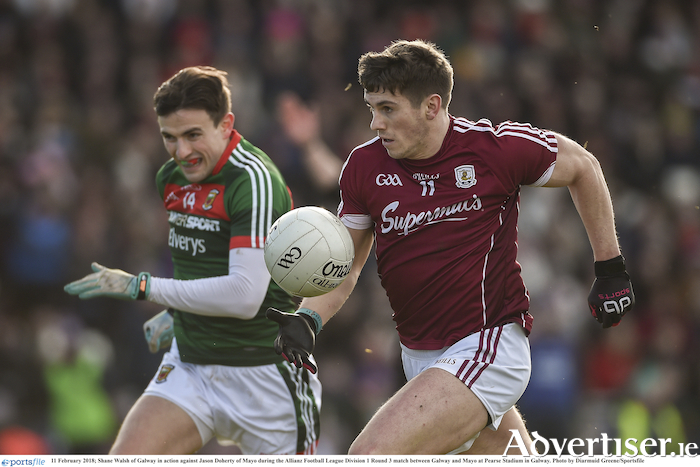 The Galway and Mayo footballers enjoyed plenty of national exposure in the media as a result of two melees and three red cards that came at the end of what had been an entertaining National League fixture at Pearse Stadium on Sunday. Galway won the tie handily enough, by 1-13 to 0-11, with Mountbellew's Barry McHugh taking his goal chance with super confidence and style in the first half. It is Galway's fourth consecutive win over the Mayo men in competitive fare, but it was a pity the second round of aggressive pushing and shoving occurred, which resulted in the experienced Paul Conroy getting a second yellow card for an unnecessary display of peevishness. The game was won, done and dusted. There was absolutely nothing to be gained by jostling any Mayo player, which was always likely to start another round of unseemly behaviour, bar giving the Red and Green players some extra petrol to throw on their championship preparations for May 13. Conroy will know his behaviour was illogical, especially having kicked two top class points when they were badly needed in the third quarter to help steer his side to victory. There was plenty to admire from a Galway perspective. The defensive cone that the management team has worked painstakingly on over the past few years is now coming to fruition and Mayo never looked like getting in for a goal. The Galway rearguard shield has yet to concede a goal in the league and that should help build belief and confidence in the squad that their defensive system is fit for purpose. The team travel to Tralee on Sunday week (February 25 ) to take on Kerry in round four, and it will be interesting to see how new full-back Seán Andy Ó Ceallaigh fares on current All-Star Paul Geaney, and if the Kingdom can be stopped raising any green flags over the 70 minutes. Up front last Sunday, the central axis of team captain Damien Comer and Shane Walsh were to the fore, with the Annaghdown man continuing his rich vein of form with two early points. Walsh's ability to cover serious ground when soloing is a real joy to observe, and his sallies really lift the mood of the crowd in a way that is reminiscent of Michael Donnellan in his pomp. However, the Kilkerrin man does need to work on his option taking when he gets into the scoring zone. After a scintillating 60 or 70 yard dash at full pelt, the better option is to lay off the ball to a colleague who is not out of puff and can just tap the ball over the bar. It does not matter who scores for a team once they get more than the other guys. St Michael's Eamon Branigan also caught the eye with his searing pace and three points from play. Team manager Kevin Walsh was pleased with his team's work-rate and application, however he more than anyone is fully cognisant that it is only February and there are many big tests ahead, none more so than the championship clash with Mayo on May 13. Lest we forget, Mayo were without regulars last weekend such as Keith Higgins, Lee Keegan, Brendan Harrison, Chris Barrett, Tom Parsons, Donal Vaughan, Seamus O'Shea and current All-Star and player of the year Andy Moran. That said, after garnering six points from three games, Walsh's team is gelling well and will face the rest of their league games with confidence. "We know where we have to improve and where we are getting better. Everybody worked very hard for the cause. It was a real team effort," the Galway manager said. "It is good to have collected two more points and we are pleased with how the start of the league has gone. Nothing will change from our side in relation to doing the things we want to do in every game. "It is all getting the best out of our own players and blend in the younger lads, and there is no better place than division one to do that. Our aim is to be competitive every day we go out and that lads are matching up to that standard which is pleasing. We have Kerry away the next day and we will see how we get on down there." Galway: R Lavelle, D Kyne, S Andy O Ceallaigh, E Kerin, C Sweeney, G Bradshaw, J Heaney (0-1 ), P Conroy (0-2 ), P Cooke, S Kelly, S Walsh (0-2, 1f ), E Brannigan (0-3 ), P Sweeney, D Comer (0-2 ) (Cpt ) B McHugh (1-3, 2 fs ). Subs: S Armstrong for P Sweeney (H/T ), T Flynn for Cooke (60 ), A Varley for McHugh (70 ), G O’Donnell for Kelly (76 ), C D’Arcy for Comer (77 ), Johnny Duane for Bradshaw (77 ).